Winston Wächter Fine Art is pleased to present our second solo exhibition with photographer Robin Layton. Please join us for the opening reception with the artist on Wednesday, January 7, from 6-8 pm. Twenty years ago Robin Layton moved to Seattle having already established herself as one of the top photojournalists in the country. She was honored by LIFE magazine at the age of twenty-four as one of the country’s top photographers, selected as a Nikon ambassador and nominated for a Pulitzer Prize. Many would have been content with this success and continued on their path. But moving here awoke something more in Robin. There was a love and a comfort she found in Seattle that changed her lens. Layton merged her extensive experience in the sports world and a desire to capture moments, emotion and a sense of humanness in her 2014 series, hoop: the american dream. She explored small town and notable basketball hoops across the country, capturing imagery that is universal, while presenting the basketball hoop with a sense of dignity. The series was an enormous success and has been celebrated as a book. For her January 2015 solo exhibition at Winston Wächter Fine Art, Layton continues to merge the two seemingly disparate worlds of sports and fine art. 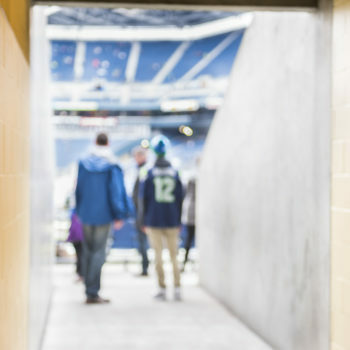 With 12, she takes us inside the community of the Twelfth Man, Seattle’s dedicated Seahawks football fans. We are part of the parade, preparing for the game with the players, making the calls and cheering them on. What is most remarkable about Layton’s work is her ability to capture the momentum and energy of the game, while simultaneously expressing the intimacy of belonging to this group. There is a quiet, a still to her work that places us in that exact moment. We are part of the experience. In Layton’s work, she is able to put you at ease. There is relatability to her photographs that make them immediately familiar, yet uniquely graceful and refined. Her mastery of light and composition only add to the works, making them an important part of any collection beyond Seattle’s borders. Layton will be available to discuss her work at the opening reception on January 7, 2015, from 6-8 PM. If you have any questions or requests for additional information please contact Judith Rinehart at gallery@winstonwachter.com or 206.652.5855.